The whole spiritual awakening process is weird. You’re going through life and having fun and then suddenly it’s like someone taps you on the shoulder and says it’s time to awaken. Then you go through your dark night of the soul which is hardly ever a one night event and you come out someone you don’t even recognize anymore, who likes crystals and drinks amethyst gem elixirs? I used to giggle when Heidi & Spencer on this one episode of The Hills showed their crystal collection. Fast forward and I became a certified crystal healer through the Hibiscus Moon certification course last year who now walks around showing everyone my crystals. Before that I took another crystal healing course and a reiki 1, 2 & master training. Well, I’m glad you asked! Crystals have a vibration and don’t laugh but years of working with them has shown me they have consciousness and and and seriously, don’t laugh but they have their own personalities too. I know you’re rolling your eyes at me. I know I just said a rock has consciousness and a personality. When I buy a new crystal I like to get to know it. So I’ll put it under my pillow and I’ll wear it exclusively on my body. There are countless times a crystal has started to beep under my pillow if I sleep in. They’re mean! 😛 I just want to sleep in and they beep to wake me up. When I first started working with clients I would ask each of my crystals if they wanted to work with ___ client. I would use my pendulum to tell me the answer. My lapis lazuli said NO! I thought it was just this one client but then it said no with every client. When I felt into it’s energy it was the saddest grumpiest crystal ever. Which really means, it needs a deep cleansing and maybe buried again in the earth forever but I haven’t been able to fully let go of it yet. Back to the topic. Crystals have a vibration. We as humans have a vibration. Everything has a vibration. This is science. If we want to shift our vibration we can do that through our thoughts, energy healing, and crystals and so many other ways. One simple way to use a crystal in a really deep way and not just benefit from the vibration but also the intention you set for the crystal is through gem elixirs. When I learned how to make gem elixirs in both of my crystal healing courses I didn’t take it seriously. Like you’re taping a rock to a bottle and then drinking the water… It’s kind of crazy. Let me tell you how that all changed. My cat, Spruce, got the worst flea infestation. When I first got Spruce I put a flea collar on him and he immediately lost his hair on his neck. The hair has never grown back. I didn’t want to use flea medication since he had a bad reaction to a flea collar. I turned to Google obviously and started researching holistic methods to treat fleas. I came across a forum where people said they used amber necklaces (you know the amber necklaces they place on babies to reduce teething pain, yup, crystal healing!). Then I found people mentioning they placed an amethyst crystal in their pets water dish and voila the fleas were gone. It sounded too good to be true. Then I found testimony after testimony saying the same thing! Except a few people said it stopped working after a few weeks (hint, it’s because they didn’t stay on top of energetically cleansing the crystal. You need to do that at least weekly). *Just be aware you should never place a crystal directly in a pet’s water dish because they might swallow it and the crystal might be toxic. I thought, this is exactly the same as making a gem elixir. So I made an amethyst gem elixir and gave it to Spruce. I am not kidding, within 4 hours like 80% of his fleas were gone! I could tell because the flea comb had hardly any fleas on it. I continued giving him the elixir in his water and each day the fleas got less and less. How Does the Gem Elixir Work? I need to warn you! Don’t drink a gem elixir for the first time if you need to drive or be doing something important. 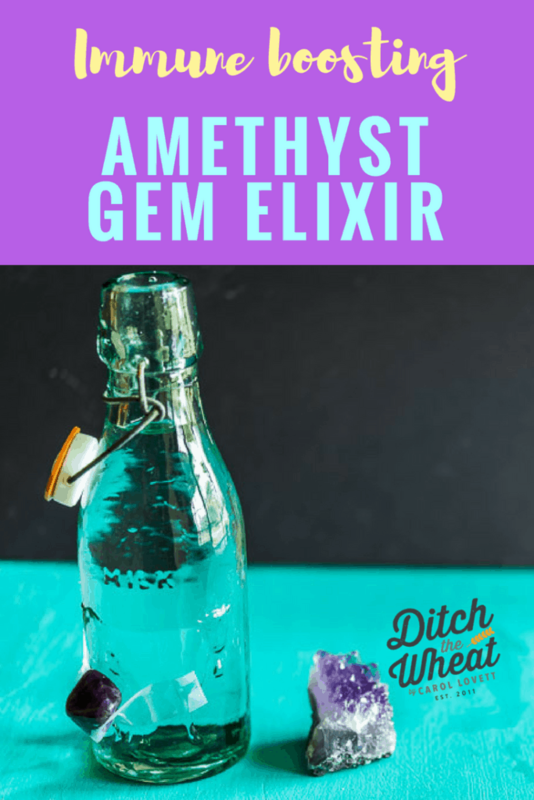 I have made gem elixirs for myself with different crystals that have made me very dizzy because my vibration was so different than the vibration I was trying to attune myself to. 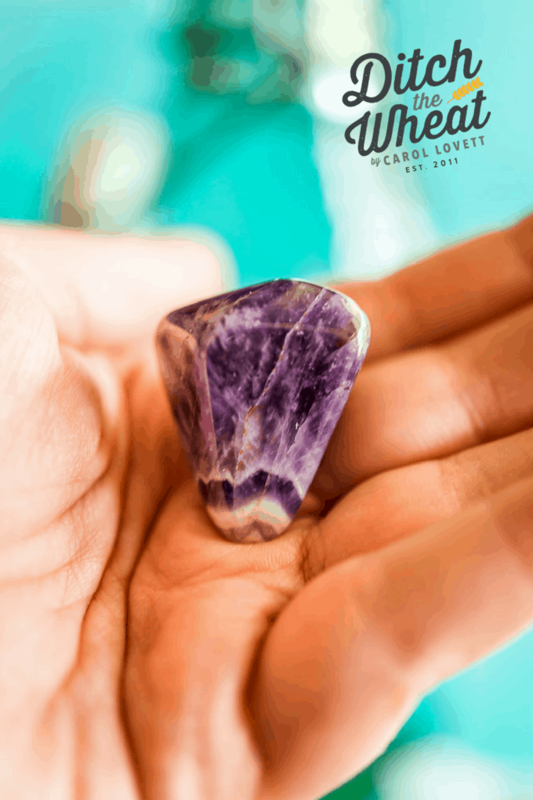 What’s Special About An Amethyst Crystal? Amethyst is known in the crystal healing world for calming your mind. It is a 3rd eye chakra crystal. It is believed to increase your immune system, help with hormones, increase digestion… and so much more. Spiritually you can use it to find the root cause behind behaviours you want to stop. It’s great for helping to overcome addictions (with the help of a professional of course). It is believed to help with ADD, obsessive compulsive disorder and hyperactivity. Indirect or Direct Gem Elixir? Indirect Method means the crystal you are using is not directly touching the water. Like in the recipe below, the crystal is taped to the outside of the bottle. I only ever use the indirect method because it takes the guesswork out of wondering if the crystal is toxic. 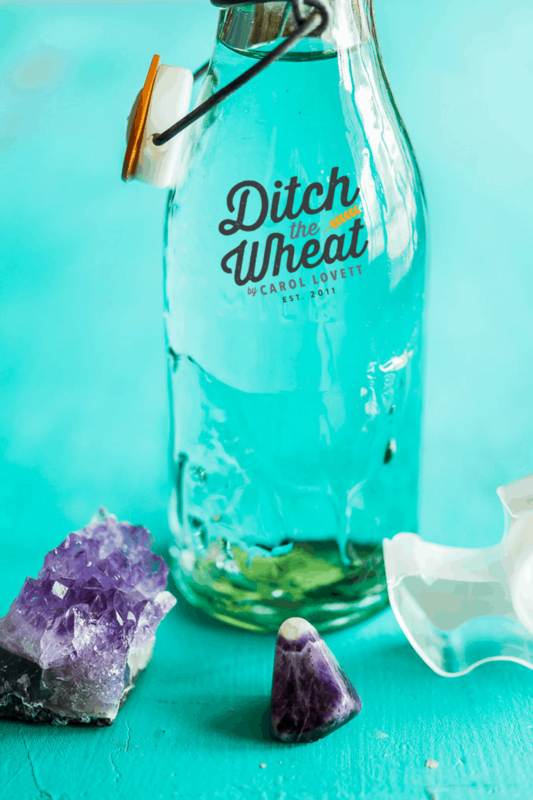 Direct Method means you place the crystal directly in the container with the water. This can be dangerous because there are lots of toxic crystals. The crystal can be dirty so any dirt will get into the water. Take your amethyst crystal and energetically cleanse it. My favourite way to cleanse is to use a smokeless smudge spray (like this one). You spray the crystal with the smokeless smudge spray once or twice and it should be cleansed. You can also use sage smudge stick (like this) and light the sage and place the crystal over the smoke to cleanse it. Do this for a few minutes. The third easiest way to cleanse a crystal is running it under water. Set the intention to cleanse and then turn on the tap and place the crystal under the running water for at least a minute or until you get the intuitive hit the crystal is cleansed. If you are sensitive to energy you will feel the energy go from dense to light. Now hold your crystal and set your intention for what you want the crystal to do. When I use this amethyst gem elixir for my cat I am always trying to boost his immune system so I set that intention. Tape your crystal to the side of the bottle. Fill with water suitable for drinking. 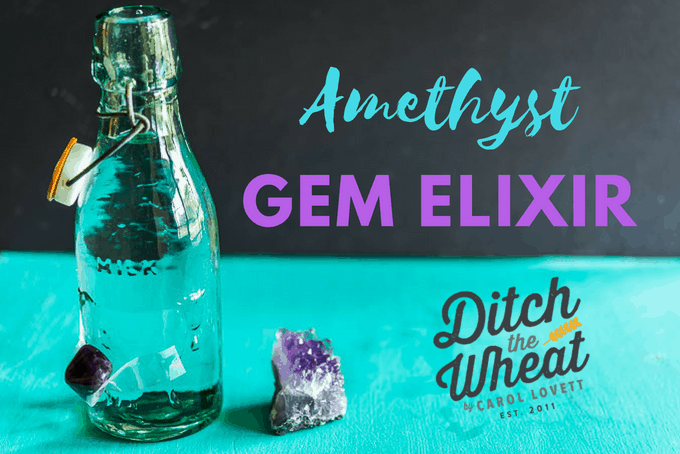 Leave the amethyst gem elixir for the day so the water can take on the vibes and intention of the crystal. To use, pour about a tablespoon amount into your water or your pet’s water once a day. You can always drink more if you want to. If you are using it for your pet one tablespoon once a day in their water is enough. Energetically cleanse the crystal at least once a week. Disclaimer: Always seek out professional help for you or your pet. Crystals are to be used as a tool not a stand alone treatment.